The views were acquired more than three months after the storm was first detected from its lightning-produced radio discharges on Nov. 27, 2007. See PIA08410 for an earlier color view of this storm. 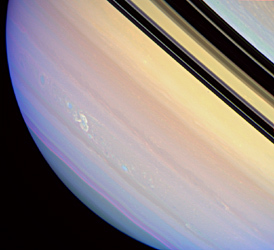 Cassini imaging scientists believe the storm to be a vertically extended disturbance that penetrates from Saturn's lower to upper troposphere. 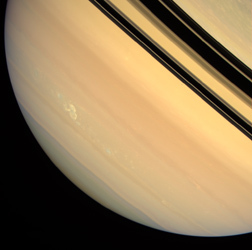 For more information about the Cassini-Huygens mission visit http://saturn.jpl.nasa.gov/. The Cassini imaging team homepage is at http://ciclops.org. The radio and plasma wave science instrument team home page is at http://www-pw.physics.uiowa.edu/plasma-wave/cassini/home.html.